Mother Nature is at it again, and the deep freeze is on in Indiana. For most, this means an early beginning to the tally of days to be made up at the end of the calendar. For others, it is just another opportunity to make use of the technology that is already in the hands of their students and teachers. Their learning continues even when the buses don't run. It has also proven a winter of discontent, as the State Board of Education called into question the use of these eLearning days as a replacement for any of the required 180 days of school. While it initially seemed that this might put a freeze on future ready districts who had already made snow day learning a reality, members of the INSBOE at yesterday's meeting recognized that the supervision of all learning experiences happens at the district level. If you missed recent stories, check out this one from WLFI or another from RTV6 in December. 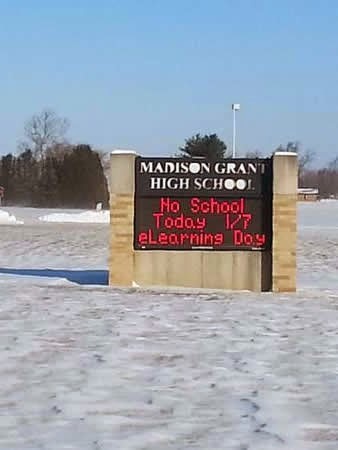 To see some learning happening in real-time on a snow day, don't miss the hashtag #eLearnOrFreeze from Southern Hancock, or #WeLearnMG from Madison-Grant. Yesterday's story from RTV6 is also outstanding, minus the misinformed editorial comment at the end. The anchor claims that every student has to have a computer, and that some schools can't afford this 1:1 ratio. In reality Indiana's 1:1 initiatives exist in districts large and small, amidst poverty as well as affluence. The Virtual Option also allows flexibility for students who don't have devices or Internet at home. Our innovative leaders have found ways to make it work in every circumstance. Doing things in a new way is never easy. Especially when it means changing something so deeply rooted in our traditions and values - our schools. Getting there does not happen without tremendous leadership. This particular step forward in the evolution of education would not have been possible without the pioneering leadership in districts like Maconaquah, Yorktown, Madison-Grant, Southwest Allen, East Noble and many more. What most stories will miss is that these districts were a part of a Flex Pilot where they worked out the issues of an eDay long before the snows ever fell. They didn't just tell us it was a good idea, they made it happen and showed us what it looked like. I'm also very proud of the leadership of my friend and colleague Candice Dodson, IDOE's Director of eLearning. Candice not only brought about the Flex Pilot and Virtual Option, nurturing their growth, but also took a stand to support our districts who have gone the extra mile to provide this experience for their students. It is the courageous leadership exhibited by Candice and our future ready superintendents that helps move all of us forward by taking advantage of the opportunities available to schools in the digital age.